Inventiveness and creative restlessness is Warp's greatest strength. Recently its roster has been reinventing itself. Clark reimagined his bonkers abrasiveness as virtuoso loveliness. Battles underwent a seismic shift with Gloss Drop, were deconstructed with Dross Glop and now are going back to basics'. Tom Jenkinson's decision to revert (almost) to type is something of an anomaly then. Opener '4001' is all whirring hi-hats and pinging beeps. Descending bass is punctuated by chimes, before the spastic breaks see it all get a bit old skool. The repeated cyclical build-hold-break motif runs across the whole album, and is executed with the sort of élan we've come to expect from Jenkinson. It's enjoyable, it's reassuring. Familiar. But it is the novel elements that really shine. Like the slow, subtle tones that rise, and expand, blooming cloudlike or drifting like warships across the album. Or the hints at the hyperkinetic sounds of labelmates Rustie and Hudson Mohawke. The breaks may be a little familiar but this is not a throwback album, and he may not go toe-to-toe with some of the newer hyperkinetic upstarts but Ufabulum injects a little of their warmth and silliness. 'Unreal Square' is almost a pastiche of himself, 'Stadium Ice' verges on Final Fantasy VII-esque. At times Ufabulum seems strangely tentative, it only hitting its stride following 'Red in Blue''s cantankerous midpoint, whose slo-mo cyber horror hits the breaks a little too hard. The second half of the album combines the (mostly) old and (slightly) new – 'The Metallurgists' rush and recede drums, 'Drax 2''s creeping industrial claustrophobia both cave in under their own weight to reveal atmospheric loveliness. Ufabulum's apotheosis is 'Dark Steering', a juggernaut of rhythm that resolves in to crisp John Carpenterisms. '303 Scopem Hard' and 'Ecstatic Shock' take the baton and run with it, proving you can have both a lightness of touch and a pummelling rhythm, before the door slams shut. At its best it is an almost physical experience. The two fundamental components (swelling synths and explosive rhythms) exemplify heart and soul, and often explode in every direction at once – the best tracks do both simultaneously. 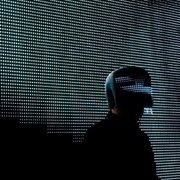 Squarepusher's attempts at redefinition have been met with bewildered shrugs and borderline distaste. Ufabulum is anchored in his strengths, and could be bolder in its experimentation, but there is enough new here to suggest that with a few more incremental changes he may once again make a truly surprising record.